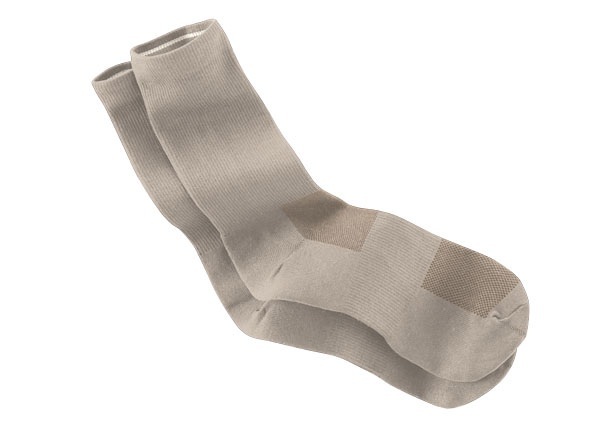 Designed with arch support and moisture escape panels for a dry and comfortable fit, these mid-calf length socks will wick away moisture and help prevent blisters. Comfy, guaranteed hole-free for 3 years and to dry overnight virtually always. Two pairs are all you need to travel the world..
Made from 49% polypropylene (with alphasan), 46% nylon and 5% Spandex. This blended fabric gives our socks their excellent moisture wicking action, fast-drying capability, durability, and comfort. Fabric certified “EXCELLENT” UV protection - UPF 50+, the maximum rating given. This fabric has been tested and certified as providing ultraviolet protection. Machine or hand wash. Air dry. Avoid machine drying. On the road? Wash them in a hotel sink, wring them in a towel, and they'll be dry in the morning.